In a small bowl, incorporate all ingredients with a fork or spatula until well combined. In an 8oz jelly jar with lid, shake all ingredients vigorously until emulsified. Preheat oven to 400F. Wrap beets in foil—small and medium beets can be wrapped in pairs or groups of three, large beets can be wrapped individually. Place wrapped beets on a sheet tray and bake for about 45 minutes to 1 hour, checking doneness after the first 30 minutes. The beets are done when a paring knife can penetrate to the center without resistance. Allow beets to cool until they can be handled. Using a paper towel and a little force, wipe off the beet skins. (If the skins don’t come off easily, roast the beets a while longer.) Cut beets into about 6 to 8 wedges each, and, in a medium or large bowl, toss with enough vinaigrette to generously coat. Salt and pepper the beet wedges to taste. 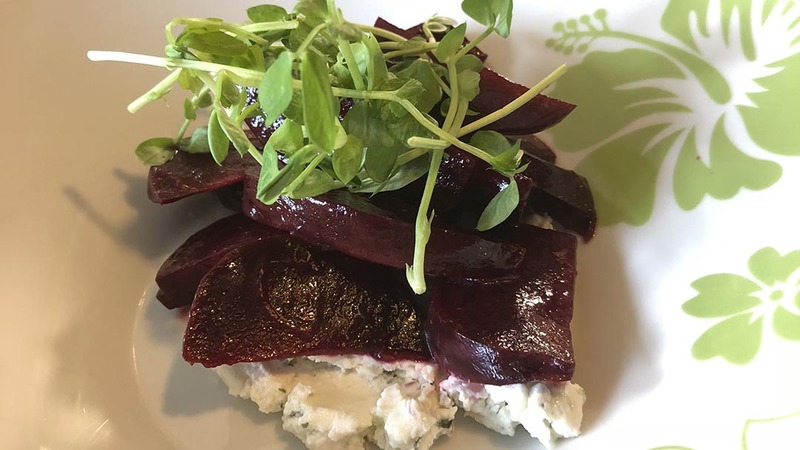 To plate: smear about 2 or 3 Tablespoons of the goat cheese spread on a plate and top with about ½ cup dressed beet wedges. You can garnish it with a pinch of reserved, minced tarragon.